It’s that time of year when us ladies are starting to get our legs out. And if you’re anything like me, this can be a tad traumatic. 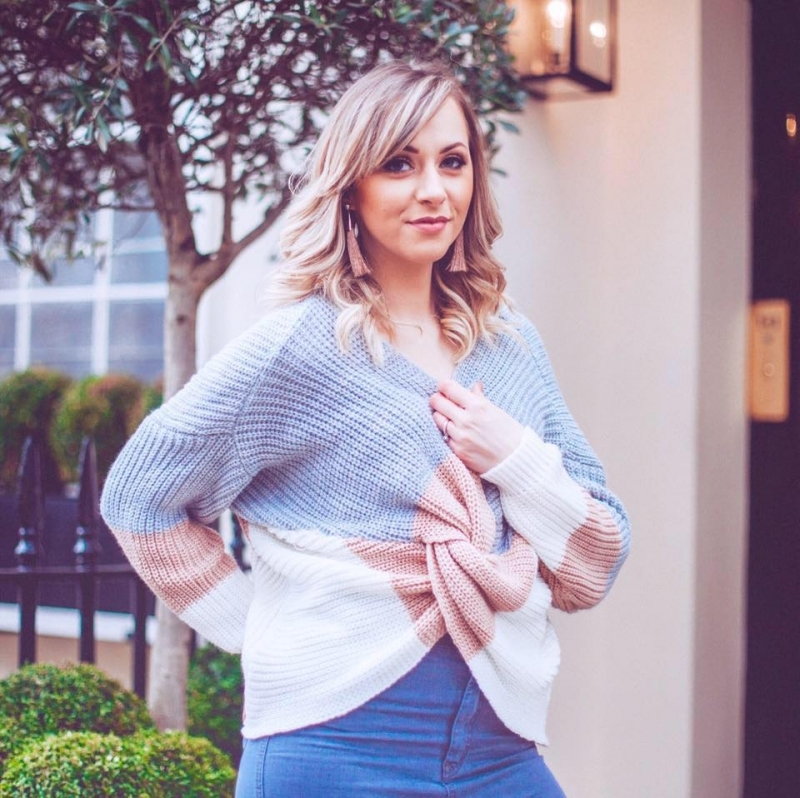 Suddenly the comfy days of jeans and trousers are banished as we welcome skirts and summer dresses to the wardrobe again. Don’t get me wrong, I love summer and summer fashion. But one thing I don’t like is the constant shaving and waxing that needs to happen to keep my pins looking and feeling soft and hair free. Men really do have it easy don’t they?! I’d thought about permanent hair removal options before, but always brushed off the thought as being too expensive. I always just assumed that laser hair removal in a cosmetic clinic was the only option for me if I wanted to banish hairs forever. And after looking into it once or twice I decided that I could live with the annoyance of daily shaving, or the pain of waxing, because the cost of permanent hair removal was too prohibitive. 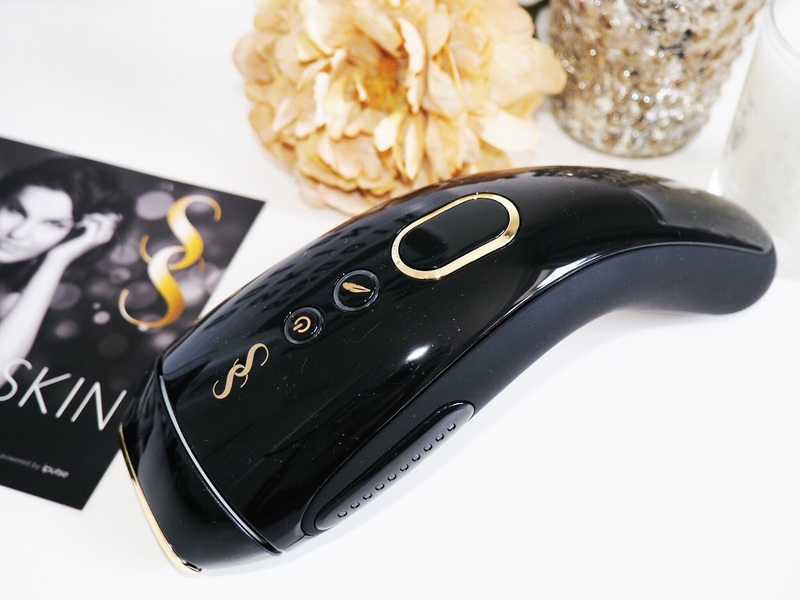 I’d never even thought about IPL hair removal systems that meant you can become permanently hair free…at home. 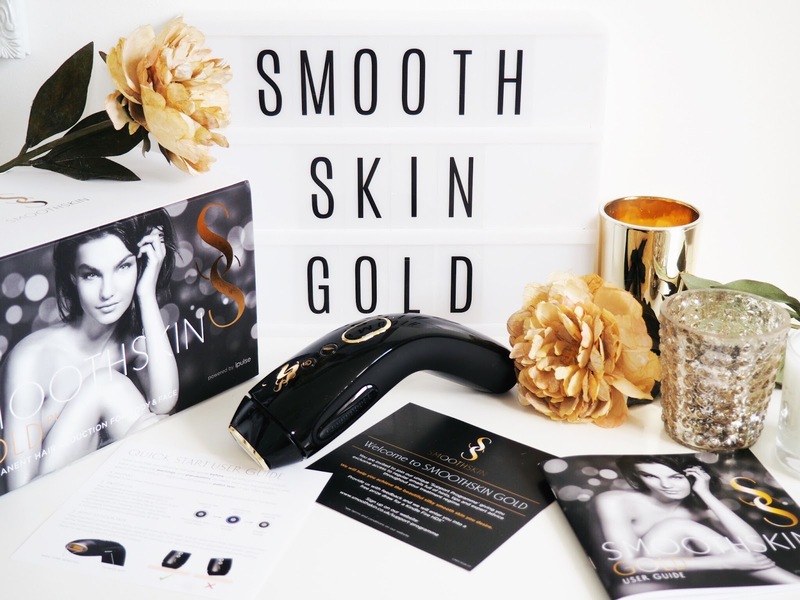 Not until I heard about Smoothskin and their Smoothskin Gold IPL device. This sleek looking device has radicalised my hair removal regime and I’m only approximately 7 weeks into the recommended 12 weekly treatments. 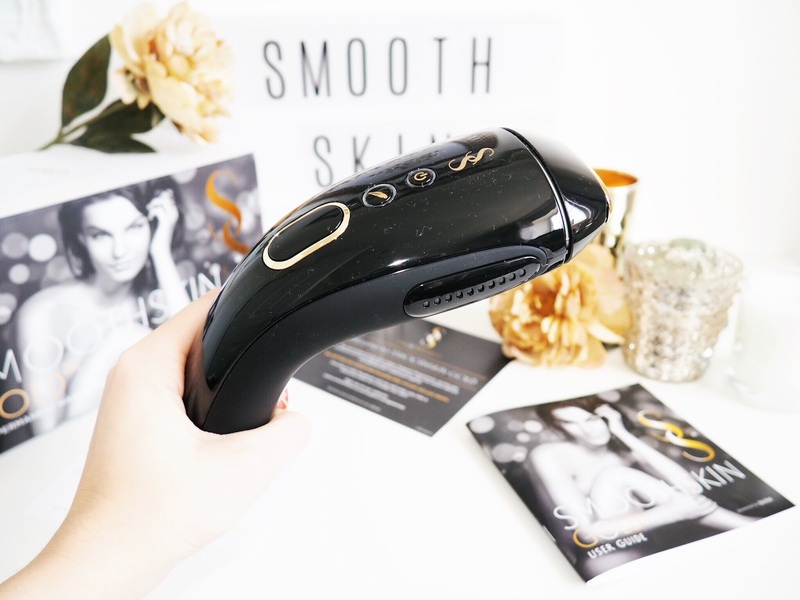 The idea with the Smoothskin Gold is that you use it weekly for 12 weeks because the growth cycle of body hairs will have been completely interrupted by this point and stopped the hair from regrowing – meaning that you should effectively be hair free and only ever need maintenance use of the device after this time. This maintenance should only be required once a month, as advised by the lovely folks at Smoothskin. 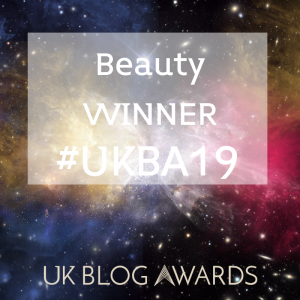 This sounded too good to be true, so when it arrived I was eager to put it to the test and see if it matched up to the claims – especially because on the Smoothskin website it says that 94% of users notice permanent hair reduction. That’s a statistic you can’t ignore. Practically speaking the IPL device is really easy to use, and it comes with thorough instructions detailing everything you could want or need to know about permanent hair removal at home. I will say at this point that there is a special setting for those with ultra sensitive skin, so if that’s you then you can still use the device, however anyone with a very dark skin tone is unfortunately unable to use the Smoothskin Gold. Using the device is really easy too, which makes the treatment really simple and when you get the hang of it, you will only need 20 minutes or so per week. You need to shave your skin to remove hair from the surface before every use – this is really important to remember. The device itself comes with skin tone sensors which are brilliant for guiding your application of the device to your skin – you can’t actually go wrong. This is really helpful in the beginning when you’re still getting used to it and you’re not 100% sure if you’re doing it right! The skin sensors also mean that if you haven’t exactly lined up the device to your skin, then the device won’t emit a flash. This is great because I was worried about overdoing the same patch, but the sensors mean you avoid this and you won’t be wasting flashes (oo-er) – it’s an intelligent little hair remover! So yes, there’s a sensation that comes with the device. But it’s not painful, not after you get used to it. I hate waxing, it’s SO painful and I think I’d rather give birth again than go back to waxing now I’ve started using the Smoothskin Gold! But seriously, there’s a hot sensation on the skin after the flash has been absorbed, but nothing to worry about, nothing that’s even counted as uncomfortable in my opinion. I usually sit in front of the TV while I’m treating my legs and the sensation isn’t even enough to distract from my gliding motion or my concentration on Emmerdale! The first few times I used the device I wasn’t sure what was normal, but you quickly get used to it and at worst it’s an itchy mild pain, at best it’s just a hot/warm sensation. It’s nothing I would’t recommend to a friend. 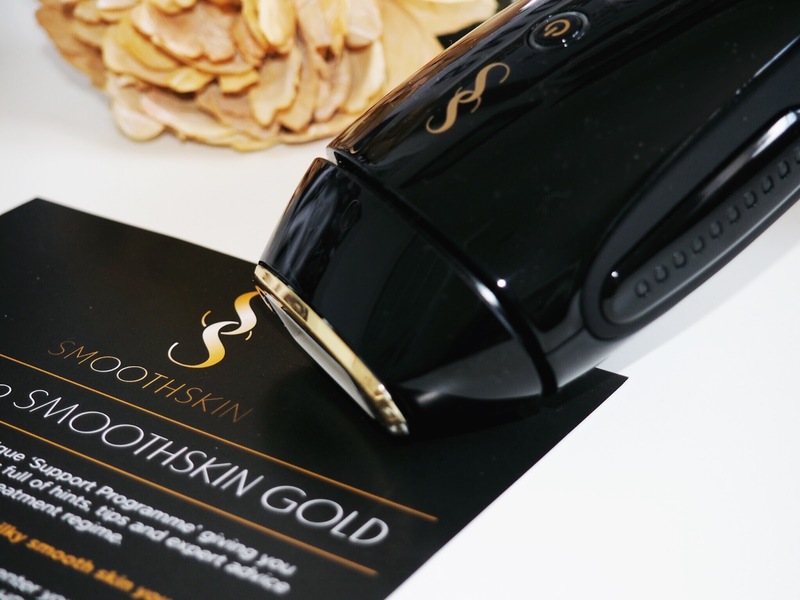 The great thing about the Smoothskin Gold aside from it’s ability to give me pins that look great all the time, is that each device comes pre-programmed with a minimum of 120,000 flashes – which is enough to last for up to six years. The device with 120,000 flashes costs £239 but actually if you work out how much a leg wax costs, you’ll spend FAR more than that over 6 years, so it’s also an incredibly cost effective hair removal method too. So…it’s easy to use, it’s programmed to be idiot-proof, (just don’t look at the light guys, please!) it’s pain free and the results are supposed to last indefinitely. You can use it almost anywhere on your body not just on your legs and I’m looking forward to trying other parts of my body soon. What more could a girl want with summer fast approaching?! I can’t wait to go on holiday feeling full of confidence to rock those tiny summer dresses and knowing I don’t have to worry about pre-holiday leg waxing ever again. Keep an eye on the blog in another 5 weeks or so for my final verdict, but so far I can’t fault the Smoothskin Gold – it’s one of my favourite skincare finds of 2016.